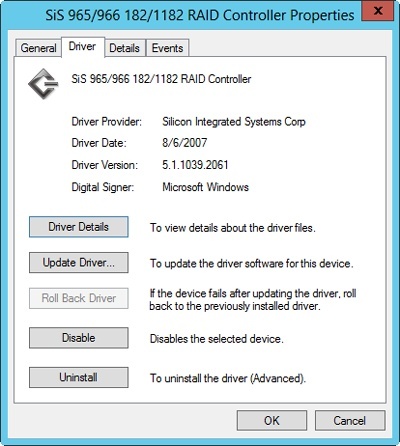 Device drivers are essential to the proper operation of Windows Server 2012. A faulty device driver can cause many problems on your systems—everything from unexpected restarts to application hangs to blue screens. To make it easier to detect and diagnose problems, you should maintain an inventory of all installed device drivers on systems you manage. Previously, I talked about using the Driverquery command to obtain a list of drivers for computers throughout the network. Ideally, the driver information should be stored on a centralized network share rather than on individual computers, or it could be printed out and placed in a binder where it is easily accessible. You should then periodically check manufacturer websites for known problems with related device drivers and for updated drivers. Windows Update can also help you because driver updates are made available through this service and can be installed automatically. Although you can be fairly certain drivers obtained through Windows Update are newer than installed versions, this isn’t the case for drivers you download yourself, and you should always double-check the driver version information before installation. As discussed previously, the current driver version is displayed in the driver’s Properties dialog box, as shown in Figure 12. Double-tap or double-click the device in Device Manager to display the driver’s Properties dialog box, and then select the Driver tab, as shown in Figure 12. Be sure to check the driver date as well as the driver version. Figure 12. Check the current driver version and date. Next, check the driver version information for the driver you downloaded. To do this, extract the downloaded driver files to a folder. In the folder, you should find .dll or .sys files. Press and hold or right-click one of these files, and choose Properties. Then, in the Properties dialog box, tap or click the Version tab to find the version information. In Group Policy, the main policy that controls access to Windows Update is Turn Off Access To All Windows Update Features. This policy is under Computer Configuration\Administrative Templates\System\Internet Communication Management\Internet Communication Settings. If you enable this policy setting, all Windows Update features are blocked and not available to users. Users will also be unable to access the Windows Update website. In early releases of the Windows operating system, other policies could be used to control driver search locations and driver search prompts. However, these policies do not apply to current Windows operating systems. Press and hold or right-click the device you want to manage, and then select Update Driver Software. This starts the Update Driver Software Wizard. You can specify whether you want to install the drivers automatically or manually by selecting the driver from a list or specific location. Updated drivers can add functionality to a device, improve performance, and resolve device problems. However, you should rarely install the latest drivers on a user’s computer without first testing them in a test environment. Test first, then install. If you elect to install the driver automatically, Windows Server 2012 looks for a more recent version of the device driver and installs the driver if found. If a more recent version of the driver is not found, Windows Server 2012 keeps the current driver. In either case, tap or click Close to complete the process and then skip the remaining steps. Search for the driver If you want to search for drivers, tap or click Browse to select a search location. Use the Browse For Folder dialog box to select the start folder for the search, and then tap or click OK. Because all subfolders of the selected folder are searched automatically, you can select the drive root path, such as C, to search an entire drive. Choose the driver to install If you want to choose the driver to install, tap or click Let Me Pick From A List Of Device Drivers On My Computer. The wizard then displays a list of common hardware types. Select the appropriate hardware type, such as Modems or Network Adapters, and then tap or click Next. Scroll through the list of manufacturers to find the manufacturer of the device, and then choose the appropriate device in the right pane. If the manufacturer or device you want to use isn’t listed, insert the media containing the device driver disc or USB flash drive, and then tap or click Have Disk. Follow the prompts. Afterward, select the appropriate device. After selecting a device driver through a search or a manual selection, continue through the installation process by tapping or clicking Next. Tap or click Close when the driver installation is completed. If the wizard can’t find an appropriate driver, you need to obtain one and then repeat this procedure. Keep in mind that in some cases you’ll need to restart the computer to activate the newly installed or updated device driver.